All One Bedroom villas are ideal for couples and honeymooners. Every villa has a private plunge pool and open living areas just beside the pool. 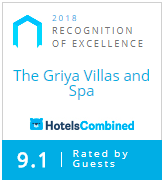 The Griya One Bedroom deluxe pool villa is bigger, more spacious and have bigger swimming pool and living areas than standard One Bedroom Pool Villa. Two Bedroom villas are following the same modern Balinese design. Sizeable private swimming pool with magnificent views to the sea and surrounding hills. If you’re looking for sheer luxury in the most authentic part of Bali, you have landed in the right place. We are located on the most Eastern tip of Bali, in an area known as Amed. Our resort sits on the hilltop overlooking the beautiful and tranquil bay of Lipah. The word "Griya" is the Hindu word that refers to "a larger residence, that consists of multiple courtyards". The Griya features14 intimate and luxurious villas. Each villa offers a private infinity pool and stunning vistas over the ocean and the neighboring hills. We guarantee that you will thoroughly enjoy the very warm and tropical atmosphere, as well as the absolute peace and tranquility. Our architect's vision has been to set the resort in a natural haven, by blending the sloping contour of the land - with the spectacular sea and mountain views - together with natural and specific materials, all indigenous from Bali. The traditional Balinese design of the villas has been combined with a very contemporary look-and-feel. Each villa is stylishly furnished with state-of-the art interiors, entertainment systems, lighting and the finest furniture and fittings to match today’s standards of luxury. All villas are complemented by luxury level facilities including a restaurant, a rooftop lounge, a Wellness Centre (spa, gym & sauna), a resort boutique. (find out more beside). As a result, you will experience the modern, high comfort and luxury haven in a natural and tropical environment. Nothing compares to the sense of freedom you will get from this fantastic wide-open view. You will enjoy starting your day contemplating the sunrise over the island of Lombok. After your day of activities relax in our Rooftop Lounge to sip your favorite cocktail during Happy Hour, while watching the most incredible sunsets. Our high-perched terrace has been designed for you to enjoy the afternoon breeze with breathtaking 180-degree views of the Bali Sea and the surrounding hills. Slowly prepare yourself for the dinner in our Safka Restaurant, our award-winning restaurant, located by our Main Infinity Pool. It’s a great and beautiful open outdoor space with equally beautiful views. We serve a fresh and vibrant "à la carte" menu that features both your Indonesian and Western cuisines’ favorites. The perfect way to end your day in the paradise! Make sure you don’t miss out on a little tour in our Griya Boutique, to pick and choose from our locally hand made collection of beautiful, eco-friendly souvenirs and goodies to bring back home to your loved ones. If you are looking for the perfect opportunity to pamper yourself, to chill and to disconnect yourself from the outside hustle and bustle, make your way to our Channa Spa. We are particularly proud of this special and sacred space, and we can truly say it’s the most complete and most beautiful Spa of all of Bali’s East coast. At Channa Spa, our professional and experienced Balinese Spa ladies provide unique treatments that combine traditional Balinese with special healing methods from the Western world. Only the finest natural quality ingredients are used with our treatments to help you rejuvenate, stimulate, balance and relax your mind and your body. You’ll be happy to know our Spa also offers a modern and fully equipped air-conditioned gym (the only one in the area) as well as a real Sauna. Amed lies on the northeastern tip of Bali, about 2 to 2,5 hours drive from the Ngurah Rai International Airport. With each direct booking of minimum three nights stay with us, we provide a complimentary return airport transfer. By default, your private Griya driver will wait for you in the main International Arrivals Hall and help you with your luggage to the car. A high quality and air-conditioned car will then bring you and your loved ones safely to The Griya. During the transfer, you will be given drinking water and a refreshing towel.All you have to do is sit back, relax and enjoy the ride to the naturally stunning and peaceful area of Amed. The Griya Villas and Spa also welcomes our (much) younger guests. Our "Little Dudes & Dudettes" Kid’s Menu allows your children to choose from a lovely selection of kid’s favorite meals, drinks and desserts. Extra services include baby-sitting services (extra charge) as well as complimentary baby cots.